The modeling stage of any project is just the first step in a series of tasks you have to perform, to create an architectural visualization. Coming right after the modeling is the material editing, which may take a significant amount of time. But, having an extensive library of pre-made materials could dramatically give you an advantage. When you integrate other tools into your workflow that requires some new materials, you probably will also need some additional time to learn how to edit materials there. That is the case with the Unreal Engine. You would have to start a brand new material library from scratch. 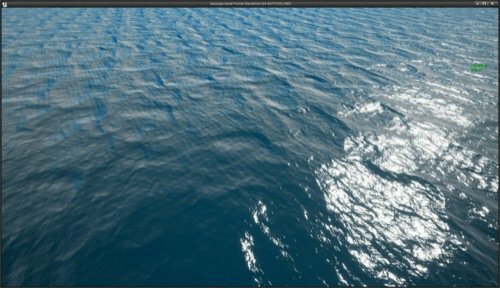 Do you want to download a free water shader for the Unreal Engine and start your Unreal library? An artist called Satheesh experimented with the conversion of an existing ocean procedural material. The source is an impressive example of how to produce a large surface of water using code. Here is the source in Shadertoy. What is Shadertoy? It is a community of artists and developers that share ideas on how to write shaders in WebGL. In theory, you could even use that ocean shader in a WebVR project. The artist took the concept and tried to recreate everything using only native Blueprints in the Unreal Engine. You can take a look at the Blueprints setup in his blog post, and also download the final result. It doesn't look the same, but for projects that require you to create a large water surface, it might be useful. You will notice that the download link points to the artist Google Drive, which means he can remove the resource at any moment. If you have a basic understanding of Blueprints, you can even try to make improvements and change the overall look of the water. What is a Blueprint? That is a feature from the Unreal Engine that looks like the Blender Node Editor. You will find a node-based system that allows you to create materials, logic and much more. For artists looking to use the Unreal Engine and not having to learn C++, it is a great alternative. Do you want to use the Unreal Engine for architectural visualization? Don't miss this other great resource, which is a free animated grass patch. And our training on how to integrate Blender with the Unreal Engine.